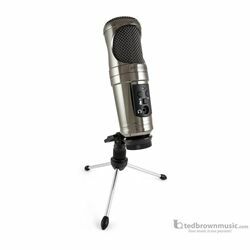 PROformance steps forward with the exciting introduction of the P755USB Collector's Edition usb studio condenser microphone. Our design criterion was straightforward - develop a high quality USB mic with true studio performance. The P755USB Studio microphone will exceed your expectations and provide superior results for your next recording session. The P755USB is equipped with propriety headphone monitoring making it easy to bring a studio recording experience to your computer. The P755USB is supplied with a Tripod stand and 10ft USB cable. Dimensions: 10" X 6.5" X 3"